Itsu Sync uses the science behind how our brains work to help you go from alert, to relaxed, to asleep within 15 minutes. This may sound impossible. You may have already tried dozens of other remedies and are still unable to fall asleep quickly, unable to get the proper restorative sleep you want that leaves you feeling rejuvenated and energetic the following morning. Itsu Sync just might be the answer to getting the type of deep sleep relaxation music your body craves. Your sleep patterns are linked to your brainwaves and when certain brainwaves are overactive and others are underactive you can end up with problems sleeping--insomnia, low energy, etc. 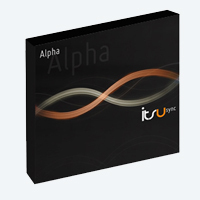 Itsu Sync uses binaural beats which are based around neuroscience to bring your brainwaves into alignment. Once those brainwaves are in alignment again, you start relaxing and sleeping well. All you have to do is start listening to Itsu Sync and you will begin to experience deep, restorative sleep. This probably sounds too easy, too simple. You may think there has to be more to it! But it really is this simple. Once you start listening to Itsu Sync your brainwaves will begin to rebalance immediately and you will start sleeping better. Itsu Sync is a form of brainwave entrainment that is able to put your mind in a relaxed state through the use of binaural beats. Binaural beats are a technology that naturally balances the brainwaves to their natural state. The combination of binaural beats for sleep and relaxing music will put you into a calm peaceful state. How Does Itsu Sync's Binaural Beats For Sleep Work? The brainwaves which control our sleep are called the "Delta and Theta" brainwaves, which normally operate between 1-4 Hz and 4-8 Hz. They are very low, slow, and methodical brainwave frequencies and this is why they are so important for deep sleep and relaxation. While these are the normal ranges they operate in many times they will start operating outside these natural frequency ranges. Too much stimulation, stress, or other forces can cause them to become overactive, operating above their normal range. So if your Theta brainwaves are operating at 12 Hz this is too fast and will prevent you from falling into a deep restful sleep. Itsu Sync uses the correct Delta and Theta binaural beats to mimic the correct frequencies your brain should be producing. Your brainwaves will naturally start moving towards the same frequency range that you are hearing through Itsu Sync. Scientific studies have shown that this happens due to the "frequency following response". What this means is if we play a 5 Hz tone our brainwaves will start moving towards the frequency being produced. When your Delta and Theta brainwaves move back into their correct frequency range you will instantly become more relaxed allowing your sleep and life to improve. What Do Itsu Sync Binaural Beats Work For? Our Delta and Theta brainwaves control a lot more than just sleep. By improving them you can get pain relief from headaches/migraines, enhance your memory, improve your ability to learn, improve meditation, and more. To learn more about everything Itsu Sync brain entrainment can offer Click Here. Try Itsu Sync on a budget, choose from our affordable single CD's or digital downloads. 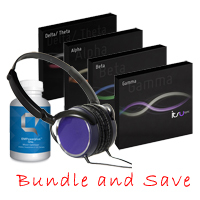 Get the entire program, including all 4 Itsu Sync CD's and our profesional binaural headphones. 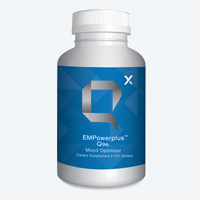 Give your brain the nutrients it needs to perform at its optimum peak!